Live the local life, at The Brunton Terrace Residence. Located in the delightful East End, just a ten-minute stroll from both the Old and New Towns, this charming three-bedroom apartment is perfect for your next visit to Edinburgh. The generously sized living room is bathed in light from the Victorian bay window, and features comfy sofas, flatscreen TV, WiFi and a dining area. The modern kitchen is fully fitted with everything you need in a holiday home, including dishwasher, Nespresso machine, and tumble dryer. Three beautiful bedrooms offer a peaceful night’s sleep, one with kingsize bed, one with double, and one twin. The master bedroom also provides access to the well maintained shared garden, with table and chairs, BBQ and a drying line. The contemporary family shower room completes this wonderful home from home. Tucked away on a quiet street, but just a haggis’ throw from the main attractions, The Brunton Terrace Residence benefits from a fabulous location. 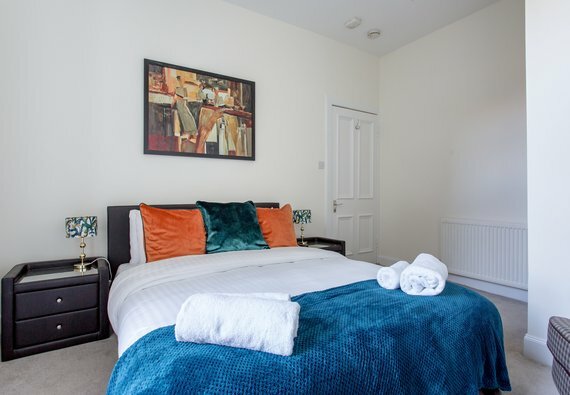 The Old Town, home to the Royal Mile, Edinburgh Castle and the Grassmarket is less than half a mile away, and the Palace of Holyroodshire is also just a ten-minute walk away. You’re also right on the edge of the New Town, famous for its glorious Georgian architecture, galleries, and seemingly endless independent boutiques, bars and eateries. No reviews yet for The Brunton Terrace Residence.